The versatile Kodak Model B Safelight can be simply set on a counter or mounted on the wall with the included wall bracket. The circular base of the stand can rotate in the wall bracket and the swivel stand allows the safelight to be tilted as required. The electrical cord can be plugged directly into an AC receptacle or the 'Safelight' receptacle of an enlarging timer. 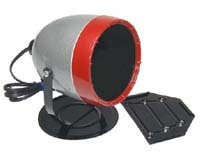 These safelights are supplied with a 5½" diameter 1A-type red filter, suitable for use with most Kodak B&W photographic papers and certain graphic arts materials. Optional filters for other photographic materials are available if required. Please refer to the product data sheet packed with the material you are using to determine the recommended safelight filter. These safelights are used and the housings and filters have minor cosmetic scrapes and scuffs, but are clean and in perfect working condition. Each safelight includes a standard 15W 130V frosted lamp and a copy of the Kodak Safelight Filters data sheet, which includes instructions for safelight testing.